Suitable for interpretation conference, 5 + 1 language channels. Designed by the latest digital technology and CE standards. Four groups of 9P-DIN plugs for system connection. Each circuit can support 50 receiving units. Totally 6 channels, includes the original floor channel. 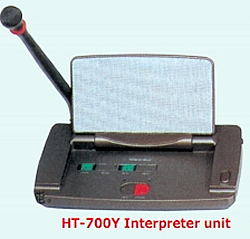 The system power supply for the interpreter unit is provided by the Main frame at 12V safe voltage. 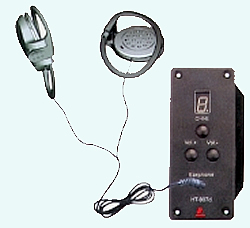 Unidirectional electret MIC and HIFI speaker. Voice adjustable with prevention of feedback. Equipped with a set of earphone. RJ45 plugs for T-type connection. The system power supply for all the delegate units is provided by the Main frame at 12V safe voltage. Digital adjusting the volume of earphone.